CORPUS CHRISTI, TX – Busy schedules, excessive screen time and lots of other factors keep kids from connecting with nature, even though study after study show that spending time outdoors makes them healthier, happier and smarter. Same goes for adults. So why not head outside together? 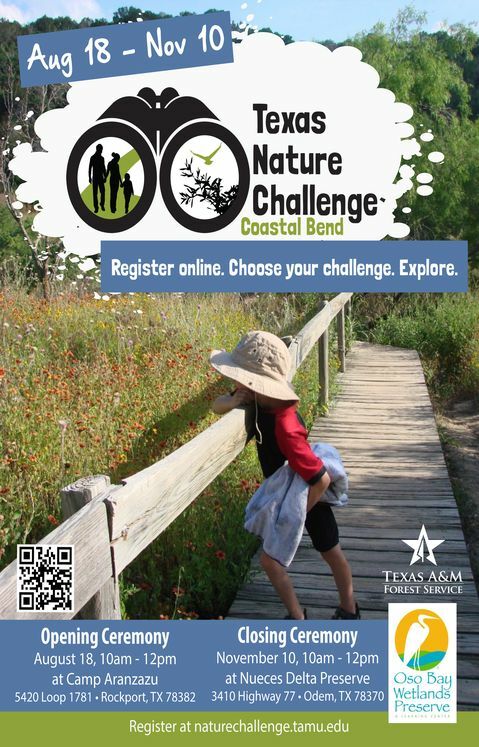 From August 18 to November 10, Coastal Bend residents will have the opportunity to venture outside and connect with nature during Texas Nature Challenge 2018. This family-oriented adventure is aimed at getting families and kids outside and visiting local parks, nature centers, and green spaces. At each site, participants complete challenges designed for family fun and nature exploration. Digital badges offer an additional opportunity for families and teams to interact with Texas Nature Challenge, other teams and participating sites. Regional coordinator Sara Jose is excited to introduce Coastal Bend families to a new set of challenges. Participating in an opening ceremony is a fun, easy way to get started. This year’s opening ceremony will be held at Camp Aranzazu in Rockport on August 18 from 10 a.m. to 12 p.m. This summer campsite is excited to share their space with families further into the fall. A closing ceremony is scheduled for November 10 where families and participants can gather to swap stories, celebrate adventures and receive awards for best blog, most creative scrapbook and more. A few of our participating sites will have activities and games set up at the Nueces Delta Preserve in Odem. “Give your family the perfect excuse to unwind, unplug and reconnect with each other and the outdoors during Texas Nature Challenge,” Jose said. The goal of the Texas Nature Challenge is to provide fun, outdoor activities for families to complete together while visiting designated nature sites across the region and developing an understanding of the benefits nature provides. Coordinated by Texas A&M Forest Service, the competition takes place throughout the year across different regions of Texas. For more information about Texas Nature Challenge 2018, visit http://naturechallenge.tamu.edu. Texas Nature Challenge on Facebook @TexasNatureChallenge.